Copyrighted 1970 to Science Fiction Writers of America. Translations copyrighted 1978 to publisher. "Printed in Germany 1978" stated on copyright page. 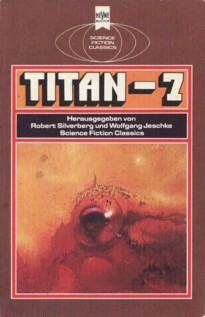 It's 'Titan-7' on the cover, but 'Titan 7' on spine and title page. "Der Waffenladen" ends on p. 143, p. 142 is the last numbered one. See indivdual content titles for the respective translators. Month from "Science Fiction Times #143".